The creaminess of the smooth goat cheese goes extremely well with the saltiness of the feta. Plus, the thyme infuses the cheese with an early goodness which is down right addictive! In a small bowl, roughly blend together both cheeses. There is no need to over mix as you want to keep this dish as rustic as possible and to allow the flavours of both types of cheese to pop in your mouth. Mix together until you get a semi-smooth texture but still have a few lumps. Add a good couple table spoons of good quality olive oil and about two tablespoons of chopped fresh thyme. Mix together and transfer to an oven proof dish. Finish with another swirl of olive oil. Place in the fridge until ready to bake. Bake in a preheated oven at around 375C or 200F for about 20 minutes. You want the cheese to be melted through, piping hot and slightly browned on top. While the cheese is baking, remove the crusts from about 4 – 5 slices of gluten free bread. For this recipe, I’ve used a Genius brown bread as it toasts very well and has a nice flavour. The gluten free toasties are nice because they soak up the lovely thyme infused olive oil and hold the cheese very well. Alternatively, this dip is great served with crackers as well. Pop the crustless bread in a toaster and remove when done. Cut each piece into three strips and repeat. These too can be made up ahead of time and left uncovered overnight if desired. They are nice the next day too as they’ll have a bit of time to dry out and get extra crispy! 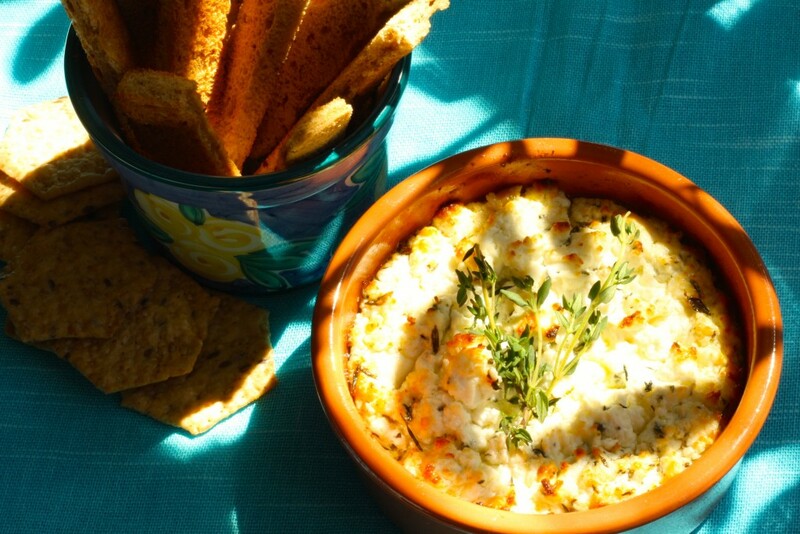 When the Goat Cheese Dip looks done, carefully remove from oven and serve hot! For an extra zip, finish with a squeeze of lemon juice (if desired). Top Tip: It’s a great idea to always keep a loaf of gluten free bread in the freezer if you have friends with a gluten issues. Also, never throw away the crusts! Dry them out and grind them down in a mini chopper to make gluten free bread crumbs! Store in a plastic bag in the freezer as they’ll keep for months!